Lama Gelongma Zangmo first became a practising Buddhist in 1977. Having received teachings from many highly-respected Lamas who visited Kagyu Samye Ling, she was inspired to enter the four-year closed retreat in 1984, during which time she became ordained as a Buddhist Nun. When the next long retreat started in 1989, Lama Zangmo wished to further her retreat experience and she was also asked to help and advise the new retreatants. Having completed that retreat in 1993, she then entered a third long retreat and became the resident retreat teacher to the other women retreatants. That retreat ended in 1997, bringing the total number of years that she spent in retreat to eleven-and-a-half. Lama Zangmo was then asked to help run Kagyu Samye Dzong London, which was officially opened in 1998. Since then the London Centre has flourished under Lama Zangmo's guidance and established itself as a much-needed Dharma Centre in the capital city, providing a full and varied programme of teachings and events throughout the year. In 1998 Lama Zangmo became fully ordained as a Gelongma (Bhikkuni) at a historic ceremony in Bodhgaya, India. Lama Zangmo is inspired to work tirelessly and joyfully in service to the Dharma and helping others. 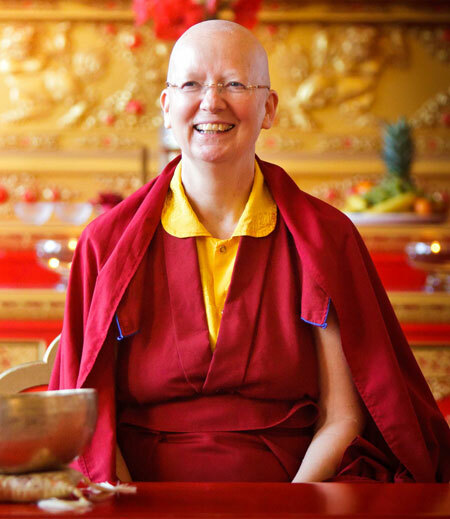 In recognition of her long experience, selfless qualities and commitment, she became the first person in the UK to be honoured with the title of Lama at a heart warming ceremony in Kagyu Samye Dzong London in June 2001.